Good360 works hard to make sure all donations are used to help those in need, and to meet all specific requirements of its corporate donors. Good360 nonprofit donations must be distributed to the ill, needy, or infants. Your organization may use donated goods only as direct charitable donations to people in need. Your organization must not sell, trade, barter, or otherwise transfer any donated goods in exchange for money, property, or services. Prohibited transfers include listing the donated goods for sale or trade on websites, in stores, at flea markets, or in any similar manner. Your organization must not use donated goods for raffles, auctions, or any fundraising activity. Your organization must not accept anything of value (including voluntary donations) in exchange for the donated goods. Your organization must not give any donated goods to its volunteers, officers, directors, employees, or contractors for personal use. Your organization must not return any donated goods to the manufacturer or to any retail store. Your organization must not give donations to another nonprofit organization or other entity. 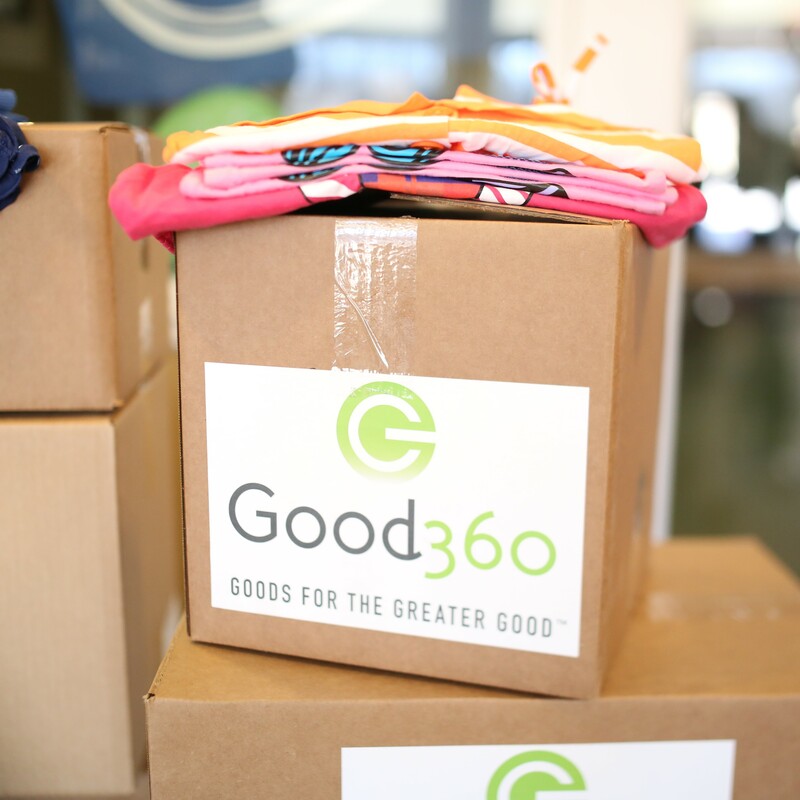 Your organization must not redistribute any donated goods to any location outside of the United States (unless Good360 has given written permission in advance). If a nonprofit violates any of these restrictions, Good360 may terminate their membership immediately. Good360 reserves the right at any time to rescind or modify its Master Donation Acceptance Agreement and/or restrictions on the use/storage of donations. We need your help! If you see a nonprofit that is potentially misusing Good360 donations or violating any of these restrictions, let us know. They may be willfully violating Good360’s terms and conditions. That hurts Good360 and all the nonprofits that benefit through its generous corporate donations. What can nonprofits do with donations? Donations must be distributed to the ill, needy, or infants. What happens if donations are misused? As part of our plan to protect the reputations of both Good360 and its corporate partners, Good360 has a Security Team. This team ensures that all nonprofit organizations adhere to the Master Donation Acceptance Agreement set forth by Good360. The Security Team also investigates all allegations of product misuse, including, but not limited to, the resale of products, and the inappropriate distribution of product to nonprofit staff, volunteers, or the general public. If allegations are investigated and found to be valid, the organization may be terminated from all Good360 programs. Where can donations be stored? Donated goods should be shipped to, stored at, and distributed from, a commercial or business location. What if donations aren’t distributed immediately? Donations that are not distributed immediately must be stored at a commercial storage facility. Donations cannot be stored at a residence, even if the organization is based out of a residence. If an organization does not have a commercial address, they may secure a self-storage unit in the organization’s name, or space may be donated from another commercial establishment within their community. Proof of either must be provided to, and approved, by Good360. What is the Master Donation Acceptance Agreement? Each organization that registers with Good360 commits to the terms of the Master Donation Acceptance Agreement. 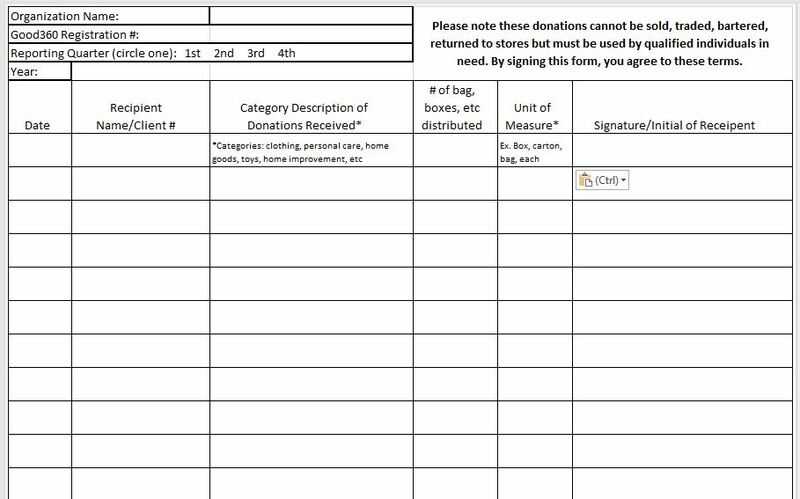 Before registering, your organization should read the Master Donation Acceptance Agreement carefully and keep a copy available to review with all new staff/volunteers to read the Master Donation Acceptance Agreement carefully and keep a copy on file for all new staff/ volunteers to read. What records are required by Good360? The Organization shall maintain accurate books and records of all Donated Goods documenting the distribution of Donated Goods and the purpose of such distribution. Your books and records shall include, but are not limited to, accurate records that reflect the total amounts received and distributed (or used) and outline the procedures the Organization uses to determine that the Donated Goods are used solely for the care of the ill, needy, or infants. The Organization shall keep such books and records and records for at least four (4) years after the end of the year of the receipt of such Donated Goods, or for such longer period as may be required by applicable federal, state, or local tax regulations. Click Here to download a sample record keeping form. What if the nonprofit is working in a disaster? Organizations working with Good360 in a disaster recovery zone are encouraged (but not required) to maintain accurate records of distribution. Upon registering with Good360 and included during check out with each order, charities acknowledge the Master Donation Acceptance Agreement which outlines the proper use of product and record keeping required as provided above. Charities participating with a retail partnership, receiving truckload donations and/or servicing as a community redistribution partner must acknowledge the Program Participation Agreement (PPA) prior to beginning any of these programs. This Agreement is acknowledged once upon ordering an initial retail partnership; completing the truckload application; and/or being approved to become a community redistribution partner. As part of the PPA, Good360 requests that charities acknowledge a Quarterly Compliance Confirmation email. At the beginning of each calendar quarter, Good360 will send an electronic form for acknowledgement that an organization has completed the required record keeping in the previous quarter and it’s available upon request by Good360. This must be acknowledged to remain current and in good standing with Good360. Click here to view a sample PPA.